In the case of the LHZ series centrifugal mixer, the two phases to be mixed are pumped jointly into a rotating mixing bowl (2), where they are accelerated to the circumferential velocity of the bowl. The centripetal pump (3) discharges the liquid mixture from the mixing bowl. 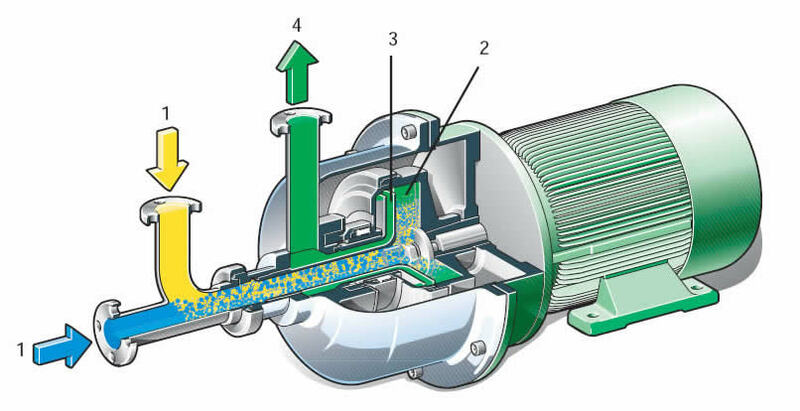 The two phases are mixed intensively in the channels of the centripetal pump. The mixed liquid is then discharged from the mixer at outlet (4). The pressure in the discharge line is adjusted with the aid of a throttling valve; this affects the suspension in such a way that the channels of the centripetal pump are immersed under the surface of the suspension and prevent any air intake. The hermetic version is the standard version for gas-tight applications. A slide ring packing ensures a hermetic seal between the bowl and the hood. The slide ring packing consists of a stainless-steel housing slide ring and a counter-ring made of hard carbon. The output of the three-phase AC motor is transferred directly from the horizontal motor shaft to the mixer bowl. The variable speed mixer with a frequency converter drive is a further development. In this solution, a frequency converter can be used for infinite electric adjustment of phase mixing. The mixing characteristics can accordingly be adjusted individually, and this aspect is of great importance particularly in the case of “multi-purpose” applications. The drop size and the required turbulence vary as a function of the speed. The frequency converter enables the performance of the mixer to be adjusted at any time.